"In a place where there are no men, strive to be a man"
The crisis of funding Jewish education is a shameful omission from the Jewish philanthropic agenda. The phrase "Where''s Waldo?" has become a shorthand idiom for finding distinctive characters hiding in a crowded maze. 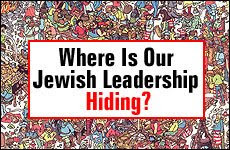 Our contemporary Jewish world has become such a maze, and a search for the hiding Waldo in Jewish leadership is in order. Where's our Waldo Jewish leadership? More marriages take place in June than in any other: approximately 264,000 couples got married this past month in the United States. That is the good news. The bad news is that among Jews, twice as many of those marriages were intermarriage unions as compared to exclusively Jewish marriages. June is also a month of graduations from educational institutions. These graduations celebrate the culmination of long and arduous educational journeys. The Jewish community in America is among the leading constituencies to earn college and postcollege degrees. Fifty-five percent of Jewish young people obtain college degrees compared to 28 percent of all other Americans. As well, 24 percent of American Jews obtain graduate degrees compared to 5 percent of all other Americans. We Jews value education: that's the good news. The bad news is that while many Jews are secularly well educated, Jewish illiteracy is rampant. A spiritual relationship with God is at an all-time low and young Jewish children are abandoning 4,000 years of linkage to the People of the Book. Children today don't even know that book's name. If the current Jewish community will be known as the "Generation That Abandoned Jewish Children," then what should we label the current hiding leadership? Jewish leadership is an oxymoronic moniker because we Jews don't like to be led by anyone. Everyone knows the old saying: two Jews, three opinions. But for purposes of this discussion, leadership will be defined as the pulpit rabbis, the policy wonks, the self-anointed lay chairmen and paid staff people at our Jewish communal organizations, who claim to set the agenda for Jewish philanthropy, the controllers of the local communal budgets and those wealthy Jews in the community who choose which philanthropies, if any, they want to support. The only glue that has connected four millennia of Jewish continuity has been intergenerational Jewish education. Without young children in every generation learning their heritage, we have no Jewish people. Throughout history, Jewish communities have somehow figured out vehicles to educate their children. The enormity of the crisis of funding Jewish education and our inability to provide an opportunity for every young Jewish family to Jewishly educate their children is a shameful omission from the Jewish philanthropic agenda. The Jewish community should scream out, "Where's the Waldo Jewish leadership?" Where are the pulpit rabbis? They sermonize about every imaginable social topic except providing free high-quality Jewish day school education for all children who seek it regardless of their religious affiliation or family financial condition. Why? Where are the Jewish Federations? They are allegedly the central community charity chests in every local community. There is not one Jewish Federation in the United Sates that has stated in their written policy, and backed it up with an enormous financial commitment, that every local constituent community will ensure that every Jewish child can attend a Jewish day school at no charge regardless of their religious affiliation or family financial condition. Why? Where are the Jewish mega donors? Every individual can choose whether he wants to give charity or not, and obviously to whomever he wishes. However, that does not prevent the rest of the Jewish community from asking which charity is the beneficiary of the donor's beneficence. According to recent surveys, less than 7 percent of major Jewish philanthropists' gifts went to Jewish institutions. The community can also ask whether those rich individuals are giving their fair share of tithing. This inquiry could easily be dismissed on the grounds that it is no one's business. But Jewish tradition has always been proud of tzedakah, which sets obligatory standards on all Jews to give a minimum of 10 percent of their income to charitable causes. How many Jews do you know who are tithing? Where are the presidents of the major Jewish organizations? Why is funding Jewish education not the number-one agenda item on any Jewish organizations' annual meeting? Why is funding Jewish education not even a significant topic at any Jewish organizational annual meeting? There is a terrible piece of black humor circulating among many young Jewish families -- families that are committed to sending their children to Jewish day schools but are struggling to pay the $15,000 tuition per child. The joke is that tuition is the best form of birth control. In fact, many families are limiting the number of children they have because they just can't fathom paying an additional $15,000 per year per child. Do we not comprehend the current tragic state of affairs facing us, the wealthiest Jewish community in the history of the world? Jewish education has become a philanthropic stepchild relegated only to the wealthy and those families willing to assume mammoth financial sacrifices, while more children are not being born because tuition for Torah education is cost-prohibitive. Where's the Waldo Jewish leadership that presided over the Generation That Abandoned Jewish Children?